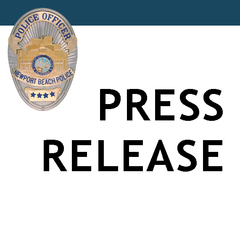 The Newport Beach Police Department would like to thank the members of the media and members of the pubic who have assisted us in this search. We are pleased to announce that detectives have been able to identify the suspect in this case. The investigation remains open and ongoing, and we encourage any additional witnesses to contact Detective Rick Henry at 949-644-3790. Messages may also be left anonymously on the Police Department’s recorded hotline at 1-800-550-NBPD. The suspect is described as white male, approximately 40-55 years old, with grey hair. He is approximately 6’ tall and weighs approximately 200 pounds. At the time of the incident, he was wearing shorts and a white t-shirt.